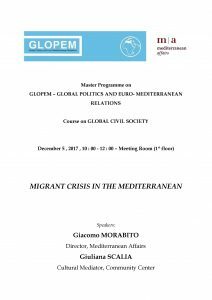 The Department of Political and Social Sciences of the University of Catania promotes a seminar on “Migrant crisis in the Mediterranean”, as part of the Master Program in Global Politics and Euro-Mediterranean Relations and in collaboration with Mediterranean Affairs. The event will be held on Tuesday, the 5th of December 2017, starting at 10 a.m., at the Department of Political and Social Sciences of the University of Catania. The round-table will focus on the SAR operations in the Mediterranean sea, the role of policy-makers and civil society organizations. Giacomo Morabito (Director of Mediterranean Affairs), Daniela Irrera (Associate Professor at the University of Catania), and Giuliana Scalia (Cultural Mediator at Waldesian Diaconia) will present the topic and discuss it with the audience.